The Salvation Army has welcomed its first refugee family under the Community Sponsorship scheme recently introduced by the Government. Fleeing conflict in Syria, the family had lost their home and been identified by the United Nations High Commissioner for Refugees (UNHCR) as being particularly vulnerable and in need of resettlement to the UK. Welcomed under the scheme they will now have the opportunity to rebuild their lives in London, supported by The Salvation Army and its community. NEW Marching Towards Justice Study Guide now available to download here! We’re very excited to make the new Marching Towards Justice Study Guide available for download here! This study guide is aimed at those attending or working at Salvation Army Corps or Centres who are interested in social justice, although it will be useful for many other settings. The four sessions cover history, method (x2 sessions) and next steps. They are intended for a small group setting (e.g. a home group or staff team meeting) and should be done alongside the reading of the Marching Towards Justice, which can be downloaded here. Author John CliftonPosted on July 10, 2016 July 28, 2016 Categories Method, Reflection, Resource, TrainingTags community, organised people, power, relationship, resource, Salvation Army, study, trainingLeave a comment on NEW Marching Towards Justice Study Guide now available to download here! Thanks to the support of The Centre for Theology and Community, we’re looking forward to releasing the Marching Towards Justice Study Guide on Sunday afternoon, after the commissioning of the authors, Sam Tomlin and Paul Williams, as Salvation Army Officers! This Study Guide will accompany Marching Towards Justice which was released a year ago. This is the story of a man, of a revolution and how he led it. It is relevant to our own revolutionary times. All great social crises turn on certain common concepts. One is that progress occurs only in response to threats, and reconciliation only results when one side gets the power and the other side gets reconciled to it. Another is that the power of organised people is required to defeat the power of the establishment and its money. A third is that effective tactics means going outside the experience of the enemy, and a fourth is that all issues must be polarised. These and other revolutionary concepts hold true through all the revolutions of man, no matter in what place or time. This article first appeared in Explore Magazine 2016 and is published with permission. I had never felt so powerless in my life. Power – which in community organising is defined as the ability to act – is the fundamental component of bringing about any sort of change you want to see. We could only make as much change as we had the power to compel. People often come to Ilford Salvation Army because we are immediately next door to the council’s Housing Advice Centre. They come to us if they haven’t got the answer they wanted. Too often we can just give someone a sleeping bag and make a referral to set them on the path to finding appropriate support, as with Mustafa. After meeting him, however, in November 2011, we discovered a group of other Christians looking to establish a winter night shelter, following the deaths of two rough sleepers the previous year. Somewhere was needed to host the shelter, and with a large upstairs hall used only for storage, we offered our building as a venue. Within weeks, 25 men and women were sleeping in sleeping bags on foam mats in our upstairs hall. Soup was served each evening and donations of clothing given out. It was basic, but it kept people alive. Over four winters, over 300 people have stayed at the night shelter. Each guest can tell their own story of the chain of events that led them to sleeping rough on the streets. The shelter is only possible because of the commitment of over 150 volunteers from a wide range of backgrounds. Salvationists are joined by members of other churches: Catholics, Baptists, Pentecostals, Methodists and non- denominational. We are joined by people of other faiths and none. The current volunteer team includes Muslims, Sikhs, Jews, atheists and agnostics. We are a diverse community brought together to meet a common need. I’ve experienced more meaningful unity of the Body of Christ at the night shelter than I have in any other ecumenical setting. A couple of years into the life of the night shelter, we realised that we shouldn’t just be giving people food and a bed. Lifesaving though this was, the night shelter needed to be a base for people to get their lives back on track and move on to a home of their own. We began convening a meeting between different local organisations to discuss what options there were for each person. Unfortunately not everyone can move on. Last winter less than a fifth of our guests moved on to a more stable environment, whether rehab, hostel or flat. For some, their options are limited by having no recourse to public funds. For others, the obstacle is the lack of genuinely affordable housing in our borough. With the lowest stock of council housing of the London boroughs, people in Redbridge are dependent on private landlords. Rents are much higher than the local housing allowance, which means that people we have worked hard to build relationships with are moving out of the borough. This is true not just for people staying in the shelter, but also for families at our toddler group, and people who consider The Salvation Army their church. Suddenly, we all became aware that the housing crisis isn’t affecting just a niche group of homeless people. It is affecting our families and our friends. It is ripping the heart out of our community. Ilford Corps is a member institution of Redbridge Citizens, the local chapter of community organising alliance Citizens UK. Citizens UK is an alliance of over 350 schools, churches, mosques, synagogues, unions, youth groups and universities committed to social justice and the common good. Self-identifying as a ‘power organisation’, Citizens UK trains local institutions in the practice of community organising, so that with their neighbours they have the power to challenge politicians, councils and businesses. By building power, people can change their neighbourhoods, cities, and ultimately the country for the better. At Ilford Salvation Army, we realised we needed to get serious about organising if we were to make the change we wanted. The local elections of 2014 provided an opportunity to take action. On Tuesday 6 May 2014, 93 citizens met at Ilford Salvation Army hall to hold a public negotiation with the three electoral candidates for leader of Redbridge Council. The three councillors were pressed by this diverse assembly to make commitments to pay a living wage to all care workers, create a private landlords register, explore the possibility of a Community Land Trust (CLT) in the borough, and to meet regularly with Redbridge Citizens to work together in addressing the issues raised at our assemblies. A lot of hard work had gone into the assembly: negotiations with politicians; a script carefully crafted; conversation convincing members to turn up. This was just the beginning. We didn’t ask the politicians to do something for us; we asked them to do something with us. Months later, a small delegation met the newly elected Leader and Deputy Leader of the Council to follow up on their commitments, including exploring developing a community land trust (CLT). A CLT is a way to develop genuinely affordable housing by taking the land into the shared ownership of the community. This removes the inflationary considerations of the land value from the cost of rent or purchase, meaning they can instead be linked to the median income of a given area. 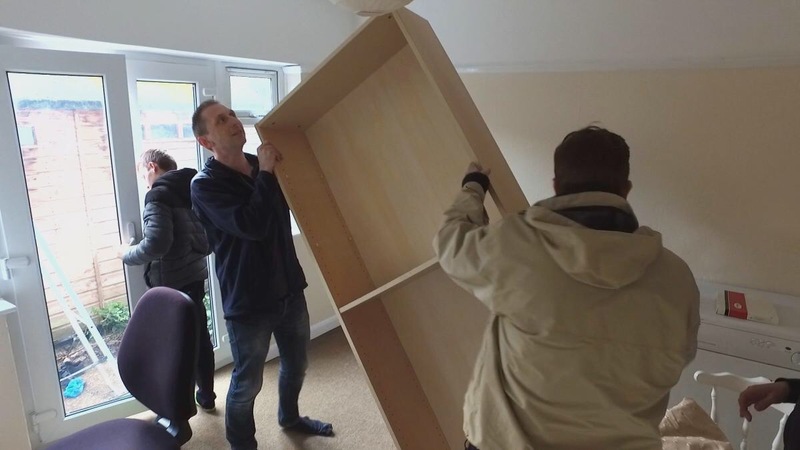 Stepney Salvation Army, through Citizens UK, had already been involved in pioneering the first urban CLT in the UK, and we believe that developing one within our borough will benefit local people struggling to find affordable places to live. After months of public actions, we engaged with the borough’s Fairness Commission and succeeded in getting them to recommend that two parcels of land be allocated towards large-scale CLTs. In November 2015, we went to a council meeting at the town hall. We filled the public gallery with 80 of our members and stood together to table a question to seek the Leader of the Council’s endorsement of the CLT. He committed to attending another assembly in February 2016 where we would celebrate signing up 300 new shareholders of the CLT – the #Pound4Power campaign. The night shelter guests have all signed up as shareholders, and one of the guests at the night shelter has signed up nearly 60 new shareholders on her own! A key aspect of these verses is that the situation is transformed. For example, the one who is hungry is fed. In other words, the homeless person gets a home – not homeless any more! What if we go a step further and recognise that one of the roots of each of these situations is the incapacity to act? Perhaps it’s also appropriate to say, ‘I had no power, but you trained me how to take it back’, so that there’s a fighting chance in that struggle ‘against the rulers, against the authorities, against the powers of this dark world and against the spiritual forces of evil in the heavenly realms’ (Ephesians 6:12 NIV). My dream for Ilford Salvation Army is that it will not just be a community where lives are saved (though it is), where a community comes together to meet a common need (though it is) and where those sleeping rough come to realise that they are valued and loved by our community (though, again, it is) – but that it will be a place where people find the capacity to act – that power might be built. The William Booth College band was proud to represent the college and the wider Salvation Army at the London Mayoral Assembly organised by London Citizens. The purpose of this assembly was to get the two frontrunners in the race for London Mayor to agree to ‘asks’ outlined in the London Citizens Manifesto. These ‘asks’, which are developed from the grassroots, focussed on the living wage, citizenship and integration, training and employment prospects for young people and housing. Live music certainly adds to the excitement of any event. The band, along with a massed children’s choir and vocal groups from other faith and community groups, performed a variety of music in the lead up to the main event. A particularly poignant and reflective moment was a multimedia presentation about issues surrounding housing in London, including the story of Church of England priest and housing reformer Basil Jellicoe. The band accompanied this presentation with the hymn tune ‘Repton’ which added to the solemnity of the moment. A twitter comment stated that you could recognise the sound of a Salvation Army band a mile off! It was a privilege for the band to take part in this distinctly Salvationist way. But, more to the point, we had the opportunity to show that we want to be involved with our elected representatives (and hold them to account) and that, ultimately, we are committed to justice and want everyone to experience life in all its fullness. U2’s Bono once said that ‘Music can change the world because it can change people’. We certainly hope that we, as a band, played our part in bringing about change in London. A matchfactory exclusive! As Salvation Army Officer appointments in the UK are made public today, we’ve consulted some battle-hardened officers, seasoned in the art of justice-seeking, to offer some top tips for the Officer who is moving appointment and wants to be ready to get going quickly. There’s some tips in there that might be relevant even if you’re not moving, and even if you’re not an Officer! They are in no priority order – some can be done before, some when you’re there. In any case, soak up the wisdom of what they’ve got to say! Check out who the MP is for your new corps (and quarters in case they’re different!) at this website. Use this website to learn more about the ward and neighbourhood surrounding your new appointment. On arrival, prepare a plan for systematic visitation, including everyone connected to the Corps. Start with the leadership team – the inner circle – and work outwards. Keep an open mind and be ready to listen. And be ready to share your story too. Ask each person what makes them angry. Ask people who attend community programmes what worries them about the community. Ask your new neighbours who the ‘movers and shakers’ are in the neighbourhood or what 1 thing you need to know about the community as a newcomer. Read about the political history of your new community. Use google or local history library. Buy a local newspaper and highlight all the local political stories. Can you identify what issues are important to your neighbourhood? Set up a google alert for news from your new area. Stick to your visitation plan. Don’t get sucked into activities or programmes. Identify those in the congregation who are passionate about social justice. Walk from the quarters to the Corps for the first few weeks. Take a different route each time and make a note of other churches, faith institutions, community organisations ready to follow up at a later date. Read Marching Towards Justice for an introduction to community organising and The Salvation Army. Have you found these tips useful? Do you have any more to add? Share them in the comments below – if they’re good we’ll add them to the list! In the Gospel of Matthew, there is a story that Jesus told about a wise and a foolish builder. The wise builder builds on rock. The foolish one builds on sand. When the rains come, the wise builder’s house stands solid but the foolish builder has his house washed away. The traditional approach to this story is to spiritualise it. We say “Oh, the house is like someone’s life. It needs to be built on the solid foundation of Jesus’ example and teachings otherwise when the storms of life come it will crumble and wash away.” I wouldn’t disagree with that. However, recently, I’ve started to interpret the passage in a different way. It makes me think about actual builders and actual housing developers. Some motivations for building are solid, like rock. Other motivations are less secure like sand. In my mind, a rock solid foundation is ‘commmunity’ – the consequence of deep relationships built between people. A sand-like foundation is profit and money, for the purpose of getting rich. Too many housing developments in my city are built on sand – they are for the purpose of making money. What we need now is housing that prioritises the fabric of our community. We need housing that helps our communities flourish, where people can put roots down and settle. I’m really excited about the London Citizens Housing Manifesto for the London mayoral election. Check it out – I think you’ll agree that the approach reflect the values of the Wise Builder whichever way you interpret it. This perspective is something we adhere to at The Salvation Army and something I try to live out as a Christian. This certainly doesn’t mean we get it right all the time – far from it – but it compels me to think twice before I walk past someone who might need a listening ear or something to eat because I might just be walking past Christ-in-disguise. A Salvationist at Ilford Corps said this recently. Download Marching Towards Justice here to learn more about how we do politics.